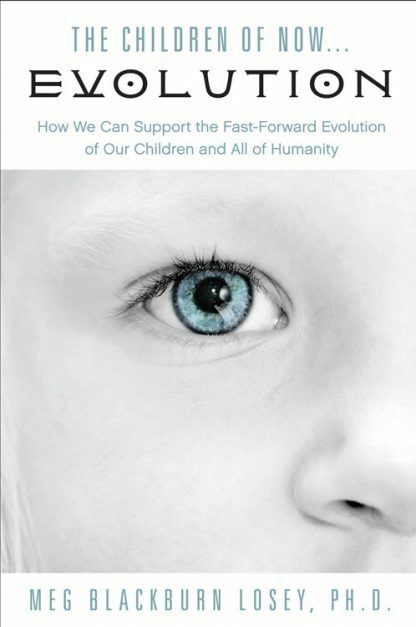 Red Wheel ∕ Weiser Online Bookstore | The Children of Now... Evolution: How We Can Support the Fast-Forward Evolution of Our Children and All of Humanity by Meg Blackburn Losey, Ph.D. Humanity is in a fast-forward stage of evolution. We saw this first with the Bridge Generation. For the past several decades, children are born into our world with various gifts and knowing � first introduced as Indigo Children and, as generations have passed, referred to as Crystalline Children, Star Children, and more. In these times, we bear witness to how consciousness and the minds of the future of humanity are changing in spectacular ways. This is a phenomenon that should not be ignored. Who are these amazing beings and why are they here? What is happening that causes some kids to remember where they came from, who they were in past lives, that they are natural healers, and so sensitive that they can�t keep still. How is it that they feel everything and can�t distinguish what feelings belong to them and what belongs to others? What is the magic of these children who embody unconditional love and have the foresight to see a new future for our people and our planet? How do their minds work and why are they hyper-sensitive in some ways and desensitized in others? Is our DNA changing and taking us into a new or different physiology? What does autism, ADD, ADHD, bipolar disorder, Asperger�s Syndrome have to do with Crystalline Children and Star Kids, if anything? Why are so many kids being drugged? Why are so many young adults falling off the edge into darker, more destructive thoughts and actions � from self-abuse with drugs to hurting themselves and worse? How are vaccines, GMO in our foods contributing to mutating human biology, particularly our DNA? How are we � society, parents, caregivers and guardians � failing to give these kids what they need? How can we? What will it take? How can we structure our schools to meet the needs of these kids? Instead of surviving their educations, how can we help them to thrive? Losey offers concrete information for parents, schools, and others to understand what these kids need and how to help them function and flourish. Too often these children are mislabeled as ADD or ADHD or worse. She also addresses the metaphysical realities that these children (and others) perceive. There may not be monsters in the closet or under the bed, but these highly-evolved children may actually be �seeing� things that their parents or caregivers cannot. Finally, she paints a picture of what our world will look like when the �Children of Now� take over. With new research and reports from the field The Children of Now Evolution is even more important to the families of today and tomorrow.